Addressing a poll rally at Junagadh in Gujarat, PM Narendra Modi took a swipe at the Congress, saying it is known by many names as far as scams are concerned. 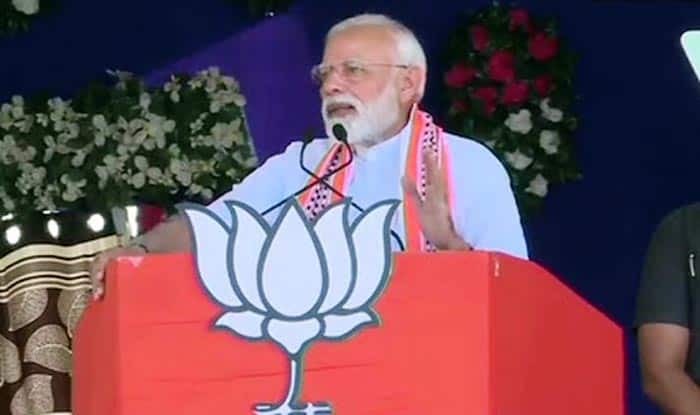 Prime Minister Narendra Modi on Wednesday accused the Congress of a “Tughlaq road election scam” where money meant for poor, pregnant women was looted from people. Notably, Congress president Rahul Gandhi’s official residence is on the Tughlaq Road in New Delhi. The Income Tax Department recently conducted raids on close aides of Madhya Pradesh Chief Minister and Congress leader Kamal Nath and others in four states on Sunday. “Now it has got a new name, but with proofs. The Congress is indulging in a ‘Tughlaq Road Chunavi ghotala’, where money meant for the poor is being usurped for their own leaders. Money meant for pregnant women is looted,” Modi said. He said the Congress in its manifesto says everybody should get bail even if they commit a serious crime. “For who is this provision, is it for your leaders? In the last five years, I have brought them to the doors of jail and if you give me next five years, they will be inside,” Modi said. Taking a dig at the Income Tax raids on Chief Minister Kamal Nath’s aides, he said after Karnataka, Madhya Pradesh has become the new ATM for the Congress. “The situation in Rajasthan and Chhattisgarh is no different. Congress is only interested to come to power to loot people,” he said. “Modi wants to remove terrorism and they want to remove Modi. There is no abuse left which the Congress has not used against your son, your chowkidar,” he added. “Our jawans have lost their lives there only for the security of common man. There is no state in the country from which jawans haven’t lost their lives,” he said. Recalling Sardar Vallabhbhai Patel’s contribution during the freedom struggle, Modi said Patel asked the Army to take the situation under control amidst mayhem then while (former prime minister Jawaharlal) Nehru kept on looking. “Had he (Sardar Patel) not been there, India would not have even got the Kashmir which it has now,” he said.